Several Israeli army jeeps invaded, on Wednesday morning, the town of Ya’bad, southwest of the northern West Bank city of Jenin, and injured several Palestinians who protested the invasion. Media sources said the soldiers invaded many homes in the town, and violently searched them while interrogating the families and inspecting their ID cards. Owners of two of the invaded homes have been identified as Ali Sabri ‘Atatra and Fathi Iskandar Sheikh Ali. Many Palestinians protested the military invasion into the town, and hurled stones at the soldiers who fired many gas bombs, and concussion grenades, and detained several Palestinians before releasing them. Medical sources said many Palestinians suffered the effects of teargas inhalation and received the needed treatment. On Wednesday morning, the soldiers invaded Sateh Marhaba area in the al-Biereh city, and the al-Am’ari refugee camp, south of al-Biereh, in the central West Bank governorate of Ramallah and al-Biereh, injured seven Palestinians, including a woman, before abducting her son, who is reportedly involved in the death of an Israeli soldier in late May 2018. 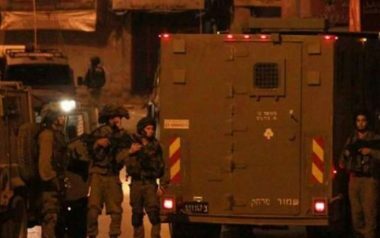 On Wednesday at dawn, the soldiers abducted five Palestinians, four of them from Silwad town, east of Ramallah, and one in Azzoun town, east of the northern West Bank city of Qalqilia.